For all 12 of you who own the base game - here's a giveaway of Waking the Tiger! Any of you looking forward to Man the Guns? I'm hoping they introduce some more formable nations. See image below for the features of this DLC. The base game was in Humble Monthly. so I expect quite a lot of people own it. I'm really looking forward to Man the Guns. I was never a fan of the naval system in HoI 4, it's not well balanced and it has some rather obtuse mechanics, so I hope they fix that! Yeah, and as long as you intended to have a navy, and had to operate outside of the usual naval bomber range, you really only had two options: Battleships & Carriers. Battle cruisers, heavy cruisers, light cruisers & destroyers were simply not worth investing in. they did not do their job as screens, and in an equal resource scenario, against other ships, battleships beat all the other kinds (including mixed fleets). I do hope they make mixed fleets better in Man the Guns, as that's really how a fleet should be constructed. 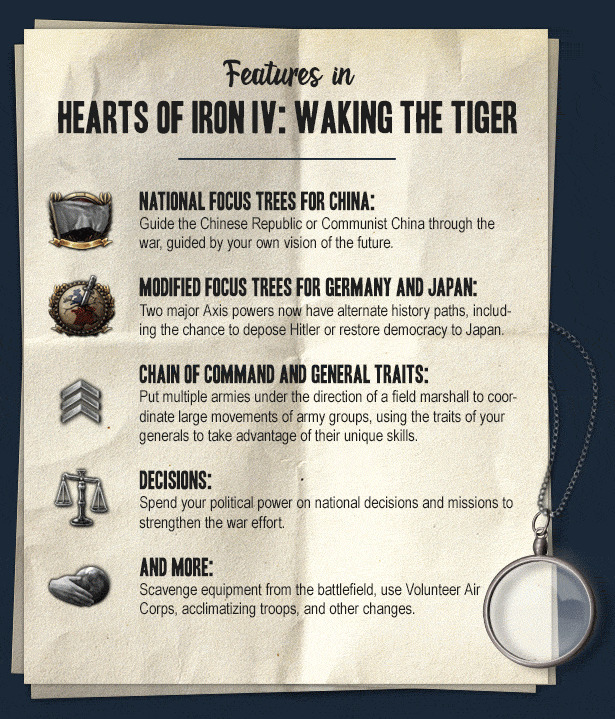 I love a couple of Paradox titles, and were very interested in HoI3 at some point, since I also love war stuff. But this one was right around the corner, so I waited for that instead. Sad to say that I never really gave it the chance it deserved. I just didn't understand enough of the game mechanics to make it a fun experience for me. A streamer I watch have been playing it lately, and it has definitely given me the urge to get back into it and give it another serious go! Very generous GA, but I shan't be entering since the HOI series is my least favorite of the Paradox games and I've barely touched IV. Cheers! Maaaan the guns! Most important feature is coming then! Netherlands will finally have its bicycle divisions!